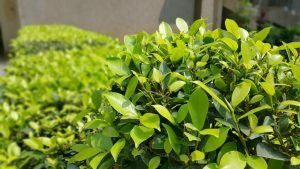 If having a green thumb is something you have never thought of you having, but you still would love a great city garden, you have came to the right place. Here you will find all the helpful tips and tricks to establishing your relaxing garden, for the good and bad weather and if you have children. Gardens are one of the first parts of a house/home a person sees. This is where someone makes an initial thought of what they expect from your home. If your garden is tidy, this will assume that the inside of your home is too, or at-least a controlled mess at most. If your garden is a mess or is overgrown, it might deter people from visiting your home, even if your home is beautiful inside. Its all about perception and prejudice. So, what if you’re are not the biggest greens-keeper compared to your neighbors and other members of your family? How can you keep your garden looking beautiful, easily? These should definitely be questions you should ask yourself about your garden. Having a lawn may be too much effort for someone like you. Having to maintain the garden all year round and then in the summer months every few weeks. It might not be your thing, and that’s okay. There are other ways to limit the upkeep of your garden. Such as a patio, decking or even turning it into a small playground for yourself or if you have kids. 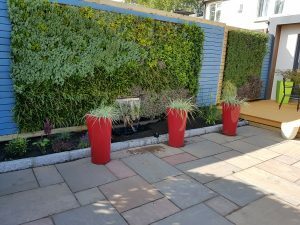 If a Patio is placed on top of grass, it will mean grass and any other plants in your garden such as nettles will eventually come through any gaps between slabs of concrete and even up past them along walls. 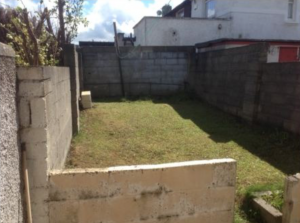 To make sure this does not happen you would need to take away all the grass in your garden already or place the patio within the grass, so it sits nicely within it. That will then make your garden easier to maintain in the long term. Decking is very similar to a Patio’s, only they are normally made of wood and other materials such as vinyl and in some case plastic (Which we do not recommend, as they can be broke easily). The best times to use decking is to get access to a great view or to form parts of your garden. Many times when decking is used, it will need to barriers as it is kind of an elevated platform from the rest of your garden, and without this, accidents may happen. The only issue with decking is that it is usually made of wood, and it looks beautiful, but to keep its looks, it needs to be maintained at least on a yearly basis. If you don’t care for your decking, if will start to become eroded and damage, meaning you might need to invest in new decking. Its a fair trade, some maintenance for some money saved. Another great alternative for a city garden is a flower garden. Picking the right plants for you may be difficult, but with our help below you will be sure, to know what plants to involve in your garden. Pick hardy, resilient plants that won’t require much TLC, think evergreens and avoid self-pollinating plants (otherwise your garden will quickly turn into a miniature forest). Shrubs require very little tending, and “evergreen” is a great word to look out for as these plants will survive all year round and still look lovely. Potted plants can be especially handy if you have a garden that stays mostly in the shade: this way, you can move your plants as needed into and out of any sunlight you receive. This will keep your plants alive as well as keeping your garden looking alive. Colourful potted plants are great to include in your garden as they bring a sense of life to your garden. If you are a novice gardener, be sure to visit your nearest garden centre for advice on low-maintenance plants. Your garden will be soon looking as good as new. Very similar to a flower garden, a vegetable patch can be easily maintained if you do it right. Many keen chefs and cooks like to produce their own ingredients. Why not use your city garden to grow some ingredients for yourself? Many herbs and vegetables can be grown in small, urban gardens, and it can be a great hobby to take up. And the best way to do this is having a vegetable patch within your garden. You could even use a green house if you wanted. Fruit can also be easily grown. The best way to have a vegetable patch within your garden is to make it yourself. Its not going to work if you don’t do this. To do this you should make a large box in your garden filled with a large amount of soil. The best vegetable patches are usually made of a box made of wood, or made within patched in your garden. But the second option can get out of control easier than the box method. Within the soil plant seeds for numerous vegetables and fruits, such as potatoes, carrots, parsnips, strawberries and much more. The best place to locate one of these patches is in a sunny part of your garden, so that they can grow easily and quickly. The summer months are the best time to grow most plants. Growing your own ingredients has become a very popular past-time with many people especially those who love to cook. When choosing what to grow, make sure to choose things you like to eat – otherwise it is a waste! If you can grow things that are usually expensive to buy in the shop, this is an added bonus as it will keep your weekly grocery costs down that little bit more. 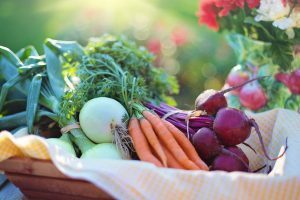 Greenside Up.ie is a great resource for gardeners – it gives advice on what best to grow in small Irish gardens, such as peas, shallots, and early potatoes. You can always turn your garden into an amazing place to entertain the whole family. In great weather a garden can become one of the best places to have family get-to-gathers, cook a barbecue and have a relaxing drink. If your garden is big enough you can even get a hot tub out for those who love to have a relaxing time in the water. We for one sure love to have a good BBQ in our downtime, with a great bunch of family around us. One of the greatest alternatives you can turn your garden into is a playground. If you are a big kid or have children yourself, having a playground can always help you out with your parenting. Many props to include in your playground for children include, swings, slides, bouncy castles and room for small bikes. Maybe even room for a football goal or other sports such as a putting green, should be thought about. This can relieve you off your parenting duties for a good few hours. The internet has a wealth of unusual and inexpensive plant containers. Many of which are ideal for both large and small city gardens. Many people who have small gardens or even just a balcony have came up with numerous genius ways to have their own beautiful garden. 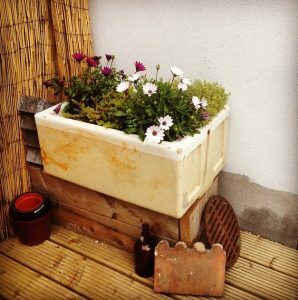 Remember to (quite literally) think outside the box when it comes to your city garden – the more unique the container, the bigger the impact a small city garden will have. 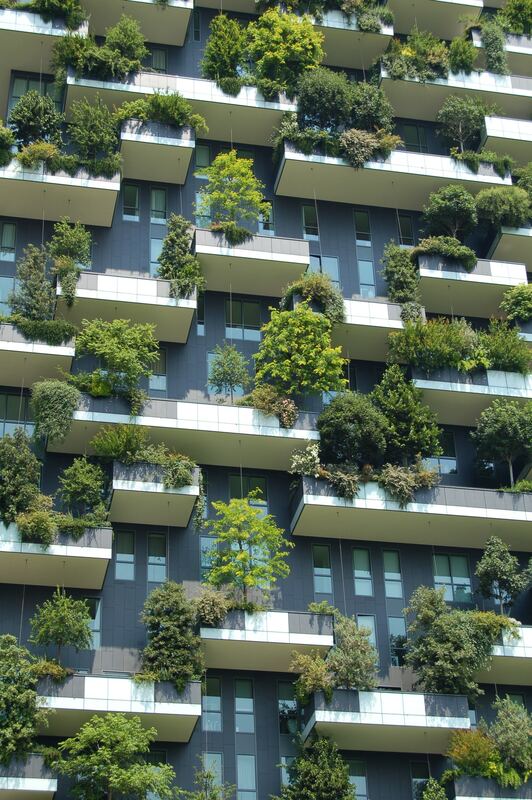 If you only have a small space to play with, why not make your city garden stand out from the crowd? Your garden can be a great feature for your property. Regardless of its size – so make the most of it. Adding some colour to your garden can make a huge impact. Brightly coloured plants and containers are great, but it doesn’t have to stop there. 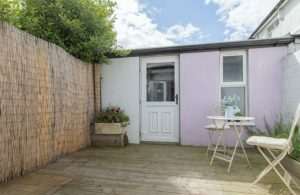 Why not paint your decking or shed a pastel shade? This will immediately brighten up even the most shaded of spaces, and makes your outdoor space look tended-to (even if it isn’t). Your garden is yours, so make the most out of it, if you want it to be low maintenance make it that, if you want it to be a place for fun make it a place for family and friends. At the end of the day it is all about what you want and how to express yourself in your garden.